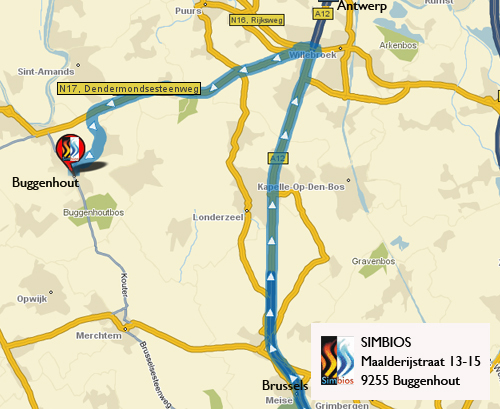 At the round point (with the AVIA fueling station) take the 3rd exit = Opdorp/Buggenhout. You are now in the "Heibosstraat". Follow the "Heibosstraat" (and later the "Damstraat") for about 1 km until the first round point. Take the first exit = "Dries". Follow the route for about 2,3km until you arrive at a Y crossroads : "Vitsstraat – Kerkstraat – Kamerstraat". Turn left on the "Kerkstraat". (direction train station). Follow the "Kerkstraat" for about 500m and turn left on the fifth street = "Maalderijstraat"
You’ll find SIMBIOS after 70m on your left.